Storage tank fabricating standards, fire codes, maintenance requirements are all intended to protect people and property from the inherent risks in storage of flammable liquids. None of these measures though, offer safety if they are not implemented and enforced consistently. As the name suggests, an emergency vent allows pressure in the internal fuel tank to be released in the event of a build-up. This is important when a tank is in a critical situation such as in the event of a fire. It is imperative any tank storing Class 3.1A flammable liquid needs to have an emergency vent under Australian and New Zealand regulations. 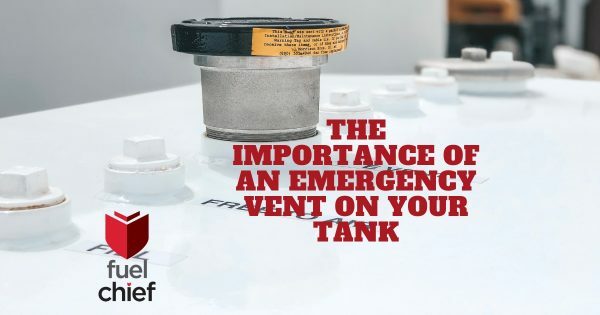 At Fuelchief we sell a variety of fire-rated tanks and we recommend that customers understand the importance of the emergency vent and ensure their tank (along with a host of other requirements) are implemented to meet state and country specific regulations. In the past 8 years there is an increased need for commercial development projects to include a standby power system that provides an alternative source of electrical energy to computer servers and similar equipment. The WorkSafe regulations (and likewise Australian Standards) requires a test certifier to approve the installation of a tank inside a building to ensure that it is properly maintained in accordance with all necessary consenting requirements. The purpose of a normal vent is to maintain the pressure inside of the tank when liquids are introduced into or are withdrawn. All storage tanks are designed to resist the vacuum and positive pressures generated when liquid is introduced into or withdrawn. Improperly sizing a tank’s normal vent or obstruction of the vent, can cause excessive negative pressure to generate inside the tank, thus causing the tank to collapse into itself. Emergency venting is a pressure relief device designed to protect the tank from being over pressurised beyond its design limits, so it does not rupture. Australian and New Zealand standards require the emergency vent to be installed and maintained in accordance with AS1940 / API2000. SuperVault – these store a variety of liquids including JetA1 and petrol and are regulated for inside buildings, therefore it is mandated that these are fitted with emergency vents. Pyrotector – likewise for the fire-resistant Pyrotector tank. DC Slimline Series (Double-Skinned Diesel) Tanks (upon request) – As diesel is non-flammable (it usually has a 125F, thus the flash point for a flammable liquid is below 100F. The flash point is the temperate that a pool of diesel will ignite when holding a flame above it.) That said, we offer our clients the addition of an emergency vent upon request. Praxis Tank (upon request) however we recommend if you are storing flammable liquids to opt for a SuperVault as the Praxis is only single-skinned. Vanguard – These are custom made so we recommend an emergency vent on these tanks. PortaQube – (upon request) this is a self-bunded fuel tank making the PortaQube ideal for refuelling plant and machinery, standby generator sets and vehicles. How is An Emergency Vent Decided For a Tank? This is decided based on EPA Class 3.1A and as per 5.5 of AS1940. Read more about these by clicking the links. Is an emergency vent opening required on all above ground tanks? No. Certain tanks are permitted to have no venting device or to use alternative means of reliving over-pressure. Specifically, AS1940 does not require tanks storing liquids with flash points at or above 200 degrees Fahrenheit (Class IIIB Liquids) to have emergency vents when they exceed 45,500L capacity and are not located in an area that might be subject to a pool fire from Class I or Class II liquids stored elsewhere. Are multiple normal and emergency vents required for tanks that have dual compartments or integral secondary containment? Yes. Each enclosed space in a tank assembly must be treated separately with respect to venting because any enclosure could be subject to an over-pressure condition. When tanks are installed inside of buildings are there any special requirements related to vent installation? There are many, and these are constantly being looked at by Australian and NZ regulators. As a general, regulators require free-to-air vents for tanks containing flammable and combustible liquid that are installed in buildings, including storage tanks and generator tanks etc. to be extended to discharge outside. Emergency venting to outside not required. Footage from a service station in America 45,500L fuel tank erupts out of the concrete due to extremely high ground water and low fuel levels causing serious damage. Another reason to always opt for an above ground fuel tank and to ensure maintenance and regulations are followed to the dot.